The screenplay for this powerful film was written by Hans Janowitz and Carl Mayer. The idea came when Janowitz was walking through a fair/carnival one night in Hamburg, Germany, when he heard laughter and suddenly a young girl ran by, disappearing into the bushes. He also saw a strange man lurking in the shadows. Later, he read in the newspaper that a girl matching the one he saw had been murdered near his location. Thus, the plot of one of the first horror films was developed around the disappearance of a young girl. The Cabinet of Dr. Caligari is one of the first films to employ the use flashbacks, and one of the first films to contain a twist ending. It was released in Germany post World War I and is considered a classic of German Expressionism. Before the release of the film, mysterious posters reading “Du muss Caligari warden” (you must become Caligari) began popping up all over Germany. The cast includes Frederic Feher (Francis) Werner Krauss (Dr. Caligari) Conrad Veidt (Cesare, the somnambulist) who later appeared in Casablanca as Major Strausser. The flashback begins, Francis and his friend Alan are competing to see who will be the lover of Jane, the ghostly woman from the opening scene. They go to the faire at Holstenwall where they encounter Dr. Caligari who presents his 23 year old somnambulist, Cesare. He keeps him asleep in a coffin, or cabinet, regularly and claims he can foretell the future by revealing secrets. Alan asks Cesare how long he has to live, to which Cesare responds that Alan has only until dawn to live. That night, the murder of Alan is told through a mysterious shadow cast on his wall. Next, Dr. Caligari spots Francis and Jane spying on him and Cesare. He then orders Cesare to kill Jane, but Cesare only kidnaps Jane from her room and dies in exhaustion after being chased with her. He didn’t kill her because of her beauty. Francis goes to visit a mental asylum to seek out Caligari only to find that Caligari is the director of the institute. 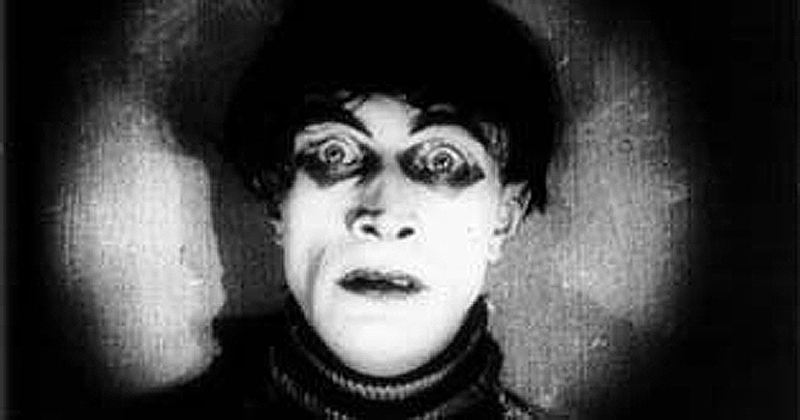 They read his journals and see that he is obsessed with an Italian named Caligari who had a somnambulist in 1703 that used to kill people. 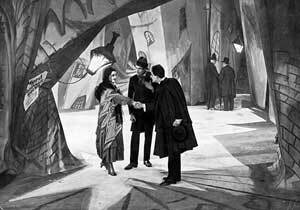 Francis and the other authorities confront Caligari about it, and when he discovers that Cesare, the somnambulist, is dead he lunges trying to kill them. They restrain Caligari and lock him up. The narrative returns to Francis on the bench in the woods, but in a twist ending we discover that Francis is actually a patient at the asylum and the story is only a fantasy. “Caligari” is the asylum director and they restrain Francis once he sees him and locks him up. The doctor says he can cure Francis, now that he knows that through his “mania” Francis believes him to be the infamous Dr. Caligari. For the film, many shadows cast were actually drawn on the ground and shapes were deliberately created to appear fragmented and obscure. One of the key notions of the Expressionist movement was Ballung, or the crystallization of inner objects, concepts, and people through an artistic expression that cuts through and discards a false exterior. The sets were all made of paper with shadows drawn on them and they were built for $800 while the actors were paid $30 per day. Writer, Janowitz was upset that Wiene framed the story as a flashback because he wanted it to be an indictment of the German government for its role in World War I, but instead Wiene glorified authority by placing Francis in an asylum. The Cabinet of Dr. Caligari is yet another example of why the German Expressionist movement led the cinematic artistic creativity of the early era of film history. The film is haunting and enchanting, the set designs are innovative and fantastic, and the acting is perfect. The Cabinet of Dr. Caligari is not only one of the best films to emerge from the silent era, but also one of the greatest films of all time.